Golf Town is Canada’s golf superstore where devotees of golf come to try, buy, learn about and improve their game. Each store features all the top brand names in golf - clubs, bags, balls, apparel, shoes, accessories, gifts and more – a veritable golfer’s paradise. To learn more, visit www.golftown.com today! 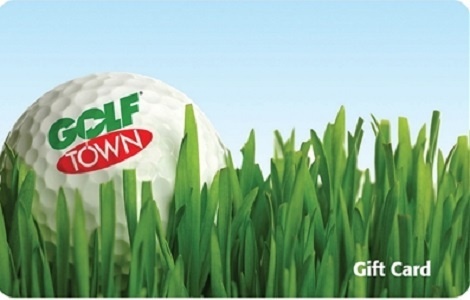 Golf Town gift cards may be used at all Golf Town stores. Golf Town gift cards can not be redeemed for cash. The value on your Golf Town gift card will not be replaced if lost, stolen, destroyed, altered or used without your permission. Your Golf Town Gift Card may only be used for consumer purchase at Golf Town stores in the ordinary course of the retail business of Golf Town and may not be used for the purchase at or accepted by any other retailer. This card cannot be redeemed for cash or applied as payment to any account unless required by law. The use of this card that in any manner implies that any business or undertaking is endorsed by or in any way affiliated with Golf Town without the express written consent of Golf Town is strictly prohibited. The value on this card will not be replaced if lost stolen destroyed altered or used in contravention of these terms and conditions. Use of this card constitutes acceptance of these terms and conditions. To obtain account balance please call 1-877-770-5228.